These double chocolate hazelnut cream nests my friends, are hands down the best sweet treat recipe on my blog so far. They are unbelievably delicious whilst being raw, dairy-free, gluten-free, grain-free AND free from added sugar. Fun to make, great for kids and they won’t take your blood sugar on a mile long high either. Packed with good fats, fibre, antioxidants, vitamins and nutrients, these treats really are pretty special. I mean, who knew that a sweet treat could have so many health benefits?! The nest / cup’s are made from hazelnuts, cacao, almond butter, sea salt and desiccated coconut. They have a lovely chewy consistency which is a great contrast to the hazelnut chocolate cream which is buttery, indulgent and thick- just like Nutella but without the 57 cubes of sugar (yes, that is in ONE standard jar). 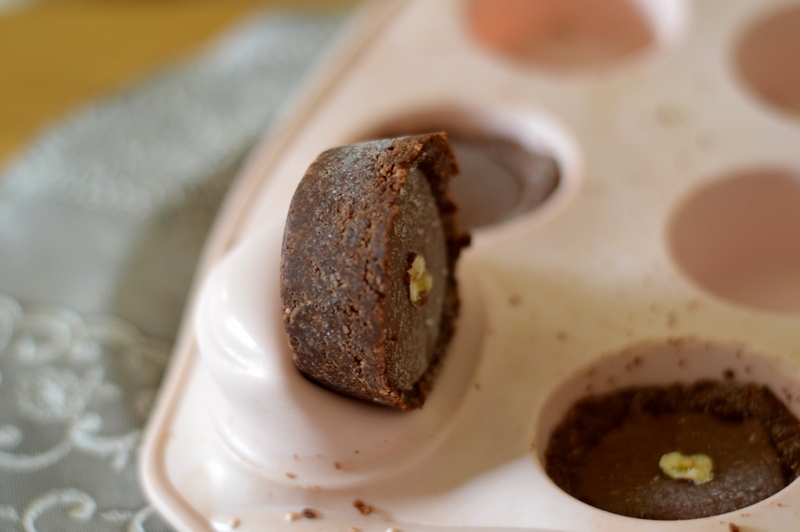 I used silicone cupcake moulds to make these. I bought mine from Asda, but I’m sure there are loads of alternatives online. It’s so nice to be back in the kitchen and blogging, I have really missed it. It also feels great to be taking photos again, although, as you can probably see below, I got a little too snap happy! Oh well, best to see these gorgeous treats at every single angle possible, I figure. Wishing you all a happy, healthy and good food filled Easter. A double chocolate hazelnut cream cup. Think healthy Nutella (minus the 57 cubes sugar) in a delicious chewy chocolate cup.